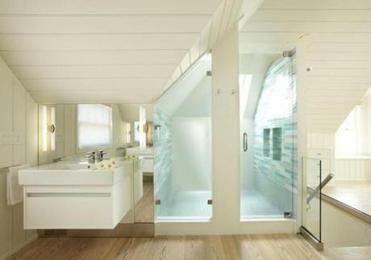 In Cambridge, an attic master suite features a daringly open bathroom. A pale blue pod conceals the toilet; at the room’s center, the bed’s dark headboard provides contrast. So Staffilani and her husband, Tom Mrowka, contacted Joseph Kennard, an architect based in South Boston’s Fort Point Channel area, whose big idea for the top of their Cambridge Victorian was to remove the walls separating the bedroom and bathroom. “When you are creating a master suite in an attic space, it is difficult to create an open floor plan due to the functional constraints — bedroom, bathroom, closets, et cetera,” says Kennard. 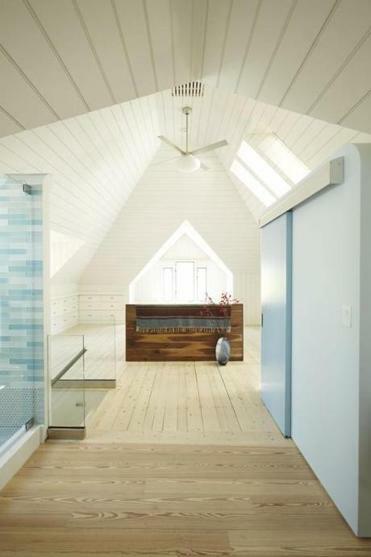 “Therefore, it is rare to get a full sense of the roofline.” He felt an open, continuous floor plan, even though it’s not typical for a bedroom and bathroom, would maximize opportunities to appreciate the roof-lines, which have four gabled ends, and to take advantage of abundant natural light. “We assured him that we were the type of people who didn’t mind having the bathroom exposed,” Staffilani says. The shower can’t be seen from the stairwell. 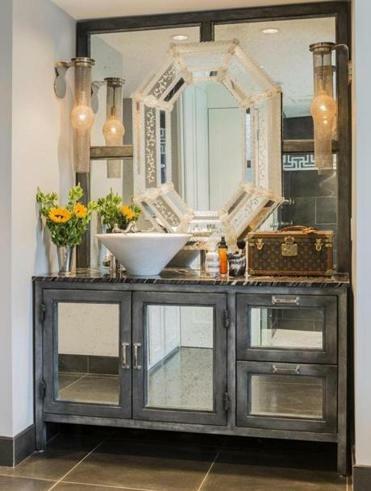 Steel, metallic finishes, even a bit of chain mail set a dramatic tone in this South End town house’s master bath. The dark stairway leading to the space got some lightening up, too. Transparent glass replaced a solid railing and bookcase. “How you initially engage with the new space is key,” says Kennard, adding that the glass also allows sunlight to filter down to the second floor. While Mrowka occasionally regrets not installing a soaking tub, Staffilani finds the shower heavenly. The wall is clad with blue glass tiles. A skylight bathes the enclosure in light and even breezes when it’s open on warm days. While Kennard suggested leaving the shower open to the bathroom suite, the homeowners nixed the idea. “I was worried it would be too cold during the winter” without a glass door, says Staffilani, who, on frosty mornings, finds comfort in the heated floor tiles underfoot.